This page has been split from a larger and more general article on Wicca. The divine couple in Wicca, with the Lady as Diana, the moon goddess, and the Lord as Pan, the horned god of the wild Earth. The lower figure is Mercury or Hermes, the god or divine force of magic - as shown by his wings and caduceus. Some Wiccans are polytheists, believing in many different deities taken from various 'pagan' pantheons, while others would believe that, in the words of Dion Fortune, "all the Goddesses are one Goddess, and all the Gods one God". Some Wiccans are both duotheistic and polytheistic, in that they honor diverse pagan deities while reserving their worship for the Wiccan Goddess and Horned God, whom they regard as the supreme deities. (This approach is not dissimilar to ancient pagan pantheons where one divine couple, a god and goddess, were seen as the supreme deities of an entire pantheon.) Some see divinity as having a real, external existence; others see the Goddesses and Gods as archetypes or thoughtforms within the collective consciousness. According to several 20th century witches, most notably Gerald Gardner, the "father of Wicca", the witches' God and Goddess are the ancient gods of the British Isles: a Horned God of hunting, death and magic who rules over an after-world paradise (often referred to as the Summerland), and a goddess, the Great Mother (who is simultaneously the Eternal Virgin and the Primordial Enchantress), who gives regeneration and rebirth to souls of the dead and love to the living. The Goddess is especially connected to the Moon and stars and the sea, while the Horned God is connected to the Sun and the forests. Gardner explains that these are the tribal gods of the witches, just as the Egyptians had their tribal gods Isis and Osiris and the Jews had Elohim; he also states that a being higher than any of these tribal gods is recognised by the witches as Prime Mover, but remains unknowable, and is of little concern to them. The Goddess is often seen as having a triple aspect; that of the maiden, mother and crone. The God is traditionally seen as being the Horned God of the woods. A key belief in Wicca is that the gods are able to manifest in personal form, either through dreams, as physical manifestations, or through the bodies of Priestesses and Priests. Gardnerian Wicca as a denomination is primarily concerned with the priestess or priest's relationship to the Goddess and God. The Lady and Lord (as they are often called) are seen as primal cosmic beings, the source of limitless power, yet they are also familiar figures who comfort and nurture their children, and often challenge or even reprimand them. Wiccan theology largely revolves around ontological dualism. Ontological dualism is traditionally a sacred gender polarity between the complementary polar opposites of male and female, who are regarded as divine lovers. This kind of dualism is common to various religions; for example, Taoism, where it is represented through yin and yang, and Hinduism, where the lingam and the yoni are symbols of the sacred sexual union of a supreme god and goddess (often Shiva and Shakti). Ontological dualism is distinct from moral dualism in that moral dualism posits a supreme force of good and a supreme force of evil. There is no supreme force of evil in Wicca. In Wicca, the God is seen as the masculine form of divinity, and the polar opposite, and equal, to the Goddess. The God is traditionally seen as the Horned God, an archetypal deity with links to the Celtic Cernunnos, English folkloric Herne the Hunter, Greek Pan, Roman Faunus and Indian Pashupati. This was the God whom Gerald Gardner presented as the old God of the ancient Witches, and who was supported by Margaret Murray's theory of the pan-European witch religion, which has largely been discredited. Horns are traditionally a sacred symbol of male virility, and male gods with horns or antlers were common in pagan religious iconography throughout the ancient world. In Wicca, the Green Man is also often associated with the Horned God, though he does not always have horns. At different times of the Wiccan year the God is seen as different personalities. He is sometimes seen as the Oak King and the Holly King, who each rule for half of the year each. Oak and Holly are two European trees. Another view of the God is that of the sun god, who is particularly revered at the sabbat of Lughnasadh. Many Wiccans see these many facets, such as the sun god, horned god, sacrificial god, as all aspects of the same God, but a minority view them as separate polytheistic deities. The most exhaustive work on Wiccan ideas of the God is the book The Witches' God by Janet and Stewart Farrar. Certain Wiccan traditions are Goddess-centric; this view differs from most traditions in that most others focus on a duality of goddess and god. Gardner's explanation aside, individual interpretations of the exact natures of the gods differ significantly, since priests and priestesses develop their own relationships with the gods through intense personal work and revelation. Many have a duotheistic conception of deity as a Goddess (of Moon, Earth and sea) and a God (of forest, hunting and the animal realm). This concept is often extended into a kind of polytheism by the belief that the gods and goddesses of all cultures are aspects of this pair (or of the Goddess alone). Others hold the various gods and goddesses to be separate and distinct. Janet Farrar and Gavin Bone have observed that Wicca is becoming more polytheistic as it matures, and embracing a more traditional pagan worldview. Many groups and individuals are drawn to particular deities from a variety of pantheons (often Celtic, Greek, or from elsewhere in Europe), whom they honour specifically. Some examples are Cernunnos and Brigit from Celtic mythology, Hecate, Lugh, and Diana. Still others do not believe in the gods as real personalities, yet attempt to have a relationship with them as personifications of universal principles or as Jungian archetypes. Some Wiccans conceive deities as akin to thoughtforms. Dryghten, an Old English term for The Lord, is the term used by Patricia Crowther to refer to the universal pantheistic deity in Wicca. Gerald Gardner had initially called it, according to the cosmological argument, the Prime Mover, a term borrowed from Aristotle, but he claimed that the witches did not worship it, and considered it unknowable. It was referred to by Scott Cunningham by the term used in Neo-Platonism, "The One"; Many Wiccans whose practice involves study of the Kabbalah also regard the Gods and Goddesses they worship as being aspects or expressions of the ineffable supreme One. Some feminist Wiccans such as Starhawk use the term Star Goddess to describe the universal pantheistic deity that created the cosmos, and regard Her as a knowable Deity that can and should be worshipped. Contrary to the popular notion that the term "Star Goddess" comes from the Charge of the Goddess, a text sacred to many Wiccans, it actually originates from the Anderson Feri Tradition of (non-Wiccan) Witchcraft- of which Starhawk was an initiate. Within the Feri tradition the "Star Goddess" is the androgynous point of all creation- from which all things (including the dual God and Goddess) emanate from. "The One" / "The All"
Given the usual interpretation of Wicca as a pantheistic and duotheistic/polytheistic religion, the monotheistic belief in a single "supreme deity" does not generally apply. An individual Wiccan's personal devotion may be centered on the traditional Horned God and the Moon Goddess of Wicca, a large number of divine "aspects" of the Wiccan God and Goddess, a large pantheon of individual pagan Gods, one specific pagan God and one specific pagan Goddess, or any combination of those perspectives. Accordingly, the religion of Wicca can be understood as duotheistic, henotheistic, pantheistic, polytheistic, or panentheistic depending upon the personal faith, cosmological belief, and philosophy of the individual Wiccan. According to current Gardnerian Wiccans, the exact names of the Goddess and God of traditional Wicca remain an initiatory secret, and they are not given in Gardner's books about witchcraft. However, the collection of Toronto Papers of Gardner's writings has been investigated by American scholars such as Aidan Kelly, leading to the suggestion that their names are Cernunnos and Aradia. These are the names used in the prototype Book of Shadows known as Ye Bok of Ye Arte Magical. 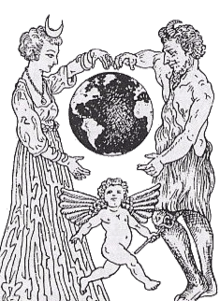 For most Wiccans, the Lord and Lady are seen as complementary polarities: male and female, force and form, comprehending all in their union; the tension and interplay between them is the basis of all creation, and this balance is seen in much of nature. The God and Goddess are sometimes symbolised as the Sun and Moon, and from her lunar associations the Goddess becomes a Triple Goddess with aspects of "Maiden", "Mother" and "Crone" corresponding to the Moon's waxing, full and waning phases. Some Wiccans hold the Goddess to be pre-eminent, since she contains and conceives all (Gaea or Mother Earth is one of her more commonly revered aspects); the God, commonly described as the Horned God or the Divine Child, is the spark of life and inspiration within her, simultaneously her lover and her child. This is reflected in the traditional structure of the coven, wherein "the High Priestess is the leader, with the High Priest as her partner; he acknowledges her primacy and supports and complements her leadership with the qualities of his own polarity." In some traditions, notably Feminist branches of Dianic Wicca, the Goddess is seen as complete unto herself, and the God is not worshipped at all. Since the Goddess is said to conceive and contain all life within her, all beings are held to be divine. This is a key understanding conveyed in the Charge of the Goddess, one of the most important texts of Wicca, and is very similar to the Hermetic understanding that "God" contains all things, and in truth is all things. For some Wiccans, this idea also involves elements of animism, and plants, rivers, rocks (and, importantly, ritual tools) are seen as spiritual beings, facets of a single life. A key belief in Wicca is that the gods are able to manifest in personal form, either through dreams, as physical manifestations, or through the bodies of Priestesses and Priests. The latter kind of manifestation is the purpose of the ritual of Drawing down the Moon (or Drawing down the Sun), whereby the Goddess is called to descend into the body of the Priestess (or the God into the Priest) to effect divine possession. The classical elements are a key feature of the Wiccan world-view. Every manifest force or form is seen to express one of the four archetypal elements — Earth, Air, Fire and Water — or several in combination. This scheme is fundamentally identical with that employed in other Western Esoteric and Hermetic traditions, such as Theosophy and the Golden Dawn, which in turn were influenced by the Hindu system of tattvas. There is no consensus as to the exact nature of these elements. One popular system is the ancient Greek conception, where the elements correspond to matter (earth) and energy (fire), with the mediating elements (water, air) relating to the phases of matter (fire/earth mixtures). The Aristotelian system proposes a fifth or quintessential element, spirit (aether, akasha). The preferred version is a matter of ongoing dispute in the Wiccan community. There are other non-scientific conceptions, but they are not widely used among Wiccans. To some Wiccans, the five points of the frequently worn pentagram symbolise, among other things, the four elements with spirit presiding at the top. The pentagram is the symbol most commonly associated with Wicca in modern times. It is often circumscribed — depicted within a circle — and is usually (though not exclusively) shown with a single point upward. The inverse pentagram, with two points up, is a symbol of the second degree initiation rite of traditional Wicca; some Wiccans have alternatively been known to associate the inverted pentagram with evil. In geometry, the pentagram is an elegant expression of the golden ratio phi which is popularly connected with ideal beauty and was considered by the Pythagoreans to express truths about the hidden nature of existence. In the casting of a magic circle, the four cardinal elements are visualised as contributing their influence from the four cardinal directions: Air in the east, Fire in the south, Water in the west and Earth in the north. There may be variations between groups though, particularly in the Southern Hemisphere, since these attributions are symbolic of (amongst other things) the path of the sun through the daytime sky. For example, in southern latitudes the sun reaches its hottest point in the northern part of the sky, and north is the direction of the Tropics, so this is commonly the direction given to Fire. Some Wiccan groups also modify the religious calendar (the Wheel of the Year) to reflect local seasonal changes; for instance, most Southern Hemisphere covens celebrate Samhain on April 30 and Beltane on October 31, reflecting the southern hemisphere's autumn and spring seasons. 1 2 3 Gardner, Gerald (1988) . The Meaning of Witchcraft. Lakemont, GA US: Copple House Books. pp. 260–261. 1 2 Gardner, Gerald (1988) . The Meaning of Witchcraft. Lakemont, GA US: Copple House Books. pp. 26–27. ↑ Adler, Margot (1979). Drawing Down the Moon. Boston: Beacon Press. pp. 25, 34–35. ISBN 0-8070-3237-9. ↑ Crowther, Patricia (1974). Witch Blood!. ↑ K., Amber (1998). Covencraft: Witchcraft for Three or More. Llewellyn. pp. 13–20. ISBN 1-56718-018-3. ↑ Hutton, R. The Triumph of the Moon. ↑ Scott, W. (transl.) (1993). Hermetica Libellus IX, p. 185. Boston:Shamballah. ↑ Valiente, Doreen (1973). An ABC of Witchcraft Past and Present. Custer, Washington: Phoenix Publishing, Inc. p. 264. ISBN 0-919345-77-8. ↑ Crowley, Vivianne Wicca: The Old Religion in the New World. ↑ Batten, Juliet (2005). Celebrating the Southern Seasons. Auckland: Random House NZ Ltd. ISBN 1-86941-734-8. ↑ Batten, Juliet. Celebrating the Southern Seasons. Auckland: Tandem Press. Anne Carson, Goddesses and Wise Women: The Literature of Feminist Spirituality 1980-1992 An Annotated Bibliography (Freedom, California: Crossing Press, 1992). Chas S. Clifton and Graham Harvey, The Paganism Reader, New York and London: Routledge, 2004. James R. Lewis, Witchcraft Today: An Encyclopedia of Wiccan and Neopagan Traditions (Santa Barbara: ABC-CLIO, 1999). J. Gordon Melton and Isotta Poggi, Magic, Witchcraft, and Paganism in America: A Bibliography, 2nd ed., (New York and London: Garland Publishing, 1992). Shelly Rabinovitch and James R. Lewis, eds., The Encyclopedia of Modern Witchcraft and Neo-Paganism (New York: Kensington Publishing, 2002). Helen A. Berger, A Community of Witches: Contemporary Neo-Paganism and Witchcraft in the United States (Columbia: University of South Carolina Press, 1999). Jon P. Bloch, New Spirituality, Self, and Belonging: How New Agers and Neo-Pagans Talk About Themselves (Westport: Praeger, 1998). Graham Harvey, Contemporary Paganism: Listening People, Speaking Earth (New York: New York University Press, 1997). Lynne Hume, Witchcraft and Paganism in Australia (Melbourne: Melbourne University Press, 1997). James R. Lewis, ed., Magical Religion and Modern Witchcraft (Albany: State University of New York Press, 1996). T. M. Luhrmann, Persuasions of the Witch's Craft: Ritual Magic in Contemporary England (London: Picador, 1994). Joanne Pearson, Richard H. Roberts and Geoffrey Samuel, eds., Nature Religion Today: Paganism in the Modern World (Edinburgh: Edinburgh University Press, 1998). Sarah M. Pike, Earthly Bodies, Magical Selves: Contemporary Pagans and the Search for Community (Berkeley/Los Angeles: University of California Press, 2001). Kathryn Rountree, Embracing the witch and the goddess: Feminist Ritual-Makers in New Zealand (London and New York: Routledge, 2004). Jone Salomonsen, Enchanted Feminism: The Reclaiming Witches of San Francisco (London and New York: Routledge, 2002).